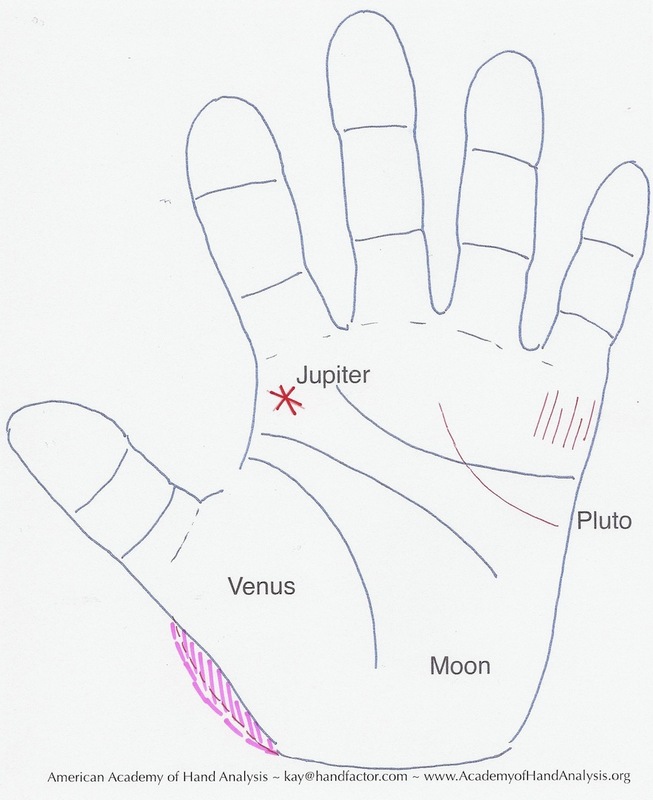 The Pluto zone sits on the outer edge of the palm, mid way, just below the start of the heart line. When I see a line starting in this section of the palm and curving up toward the ring or middle finger the owner is best suited for a career in ‘death, transformation and regeneration’. Coaching people to move through radical change such as paralyzing sports injuries, homes lost during disasters, and unexpected job loss would be a good fit. The individual with this etching has a keen ability to understand the natural process of change. If you have this line, your good hair day probability is that you regularly act as a channel, crusading from rubble to renovation to revelation. You may find yourself witnessing devastating loss leading to profound life awareness’s. You would also use your abilities to move through change, like Kubler Ross who studied and taught about five stages of grief. Ultimately you inspire others and shine the light to step onward and upward. If the owner of a Pluto line is having a bad hair day, she may feel stuck in the muck where she has experienced deep loss herself and hasn’t moved out of it yet. Maybe she is morning the loss of her grandmother after ten years. There is a healthy period for grieving the loss of a loved one. However, remaining too long in depression or denial is unfavorable to living a fulfilling life. With the line of Pluto, the potential to guide and direct others through unchartered territories is a talent to investigate and cultivate in order to live a meaningful life. Tip for the Radical Change Agent: Continue to strengthen your abilities to deal with and embrace the unexpected and align your career with your natural skill set. Gift Markings, when found on the hands, reveal a person’s potential aptitude, ability, skill, and talents – in short their gifts in very specific areas. Talents aren’t always realized because people can be reluctant to come out in their fullest potential. It’s easier to play small for most people. 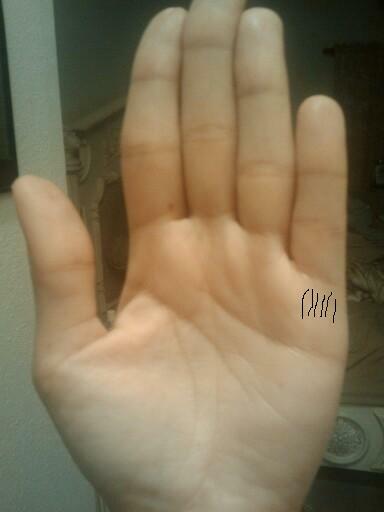 One example of a gift marking is when a person has six or more vertical lines on the mount under the pinkie finger. The lines don’t drop below the heart line. This is the mark of the Gifted Healer who has profound psychological insights. The Gifted Healer is considered a growth catalyst for personal development. Her friends inherently solicit her counsel for problems because she has a ‘listening’ ear. She personifies sage wisdom. On a good hair day she is in tune with her Inner voice, trusting the insights she perceives. She is available to herself enough to listen to, hear and respond to That Voice. She uses the gift for her own relationship, family and career challenges. The upside potential for someone with eight or more vertical stripes is to be a Healer for Healers. Professional Healers such as Therapists, Health Coaches, Veterinarians, Ministers and even Hair Dressers go to this soul-centered-practitioner for counsel and guidance. At her best, the Gifted Healer is a cheerleader for her clients, practicing as a profession. The bad hair day possibility for the Gifted Healer is that she’ll ignore her inner voice. Snubbing the inner voice leads to blocked intimacy in relationship. If you have these markings check your life flight pattern for dead end relationships or dodging exposing your truth to you mate. You’ve undoubtedly said to yourself, “Oh, if only I would have responded to that little voice inside, I would have saved myself a lot of grief.” You’re learning to work through trust issues to get to a point of trusting your self in all situations. If you have both a line of Pluto and the mark of the Gifted Healer, I’d consider you an Insightful Guide for Rebirth. Your life fulfillment blueprint includes weaving both of these skill sets as a livelihood. 1. You want to be a Healer but you don’t have the Gifted Healer mark? Not to worry. Follow your heart and be grateful you probably won’t experience the bad hair day possibility to the extreme degree of the person with the vertical stripes under the Pinkie finger. 2. We are on a learning journey. We veer off track to know where the next segment of our life path is to be found. To find the middle of the road we must drive on the reflectors in the center lane as well as run off road into a few road signs. Cautionary devices awaken us to balance. 3. If you don’t have these markings, it doesn’t mean you can’t live in these good hair day possibilities. You can do what you set your mind to. Might you have Healer markers in your hands? Let’s find out. What does the word “healing” mean to you? The Webster’s dictionary describes healing: ‘to make sound or whole; to restore to health; mend; to patch up; to restore to original purity or integrity’. Healers facilitate and motivate others to function from a higher level. We are all healers in our own way at one time or another…and when we choose to be. Most of us can cite examples where we’ve been stimulated to be and feel better mentally, physically and/or spiritually because of something someone did, said or how they listened. In the hands are various markers which identify their owners as a “healer”. Doctors, nurses, veterinarians, chiropractors, psychotherapists, and dentists are mainstream healers. Examples of alternative healers are massage therapists, Reiki masters, cranial sacral therapists, herbalogists, acupuncturists, ministers and astrologers. Hairstylists, manicurists, teachers, musicians, photographers, chefs and jewelry makers may also qualify as healers. However, not all “healers” by profession have healer-markers in their hands. Likewise, some who have never considered healing as life work may have healer markings in their hands. When a marker is seen in the hands the owner is being summoned to become available to facilitate others toward wholeness and well-being. 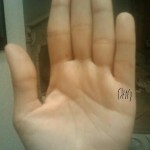 There are a number of markings that reveal natural healing in the hands. Below are three examples. The ‘gifted healer’ marking is one of these indicators. 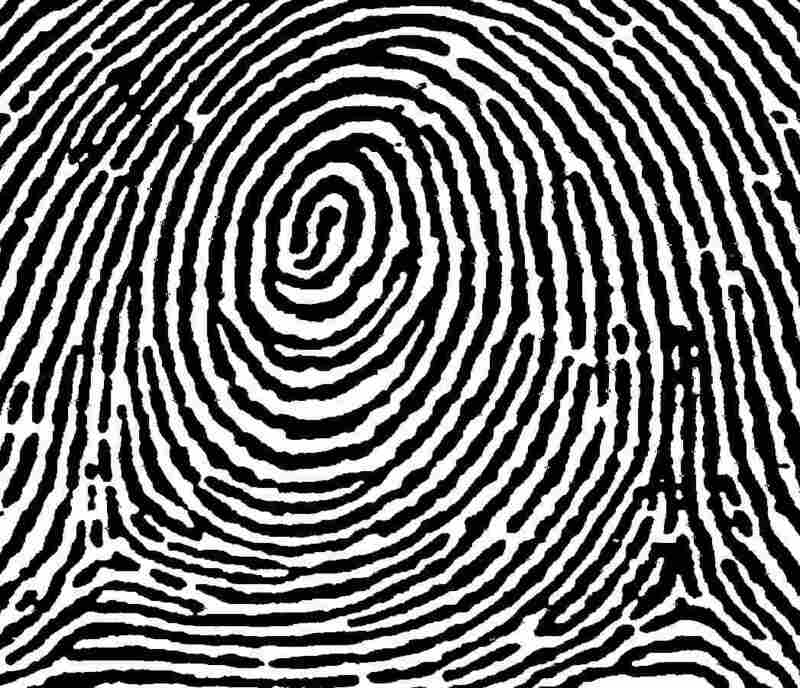 On one or both hands there may be 5-10 short vertical lines (stripes) etched into the top of the palm just under the pinkie finger. See Example below. The vertical lines are highlighted in black for location clarity only. The owner of this gift mark has an extraordinary level of self awareness that others unconsciously (or consciously) recognize. Others are often drawn to this person for inspirational insights. People generally feel better after being with the ‘gifted healer’ because, in a sense, they become transformed. The key for the owner of the stripes is that they need to be using their abilities and talents as a profession, full time, earning income for their gift. If they don’t they usually suffer from dead end relationships or blocked intimacy in existing relationships. The skills required are to TRUST the SELF – to respond to their knowingness – or intuition. This person will be regularly confronted with lessons to learn to trust their own inner guidance system. Well, truth is, we all need to do that, but the ‘gifted healer’ has ‘signed up’ to offer to catalyze growth or pay the penalty. 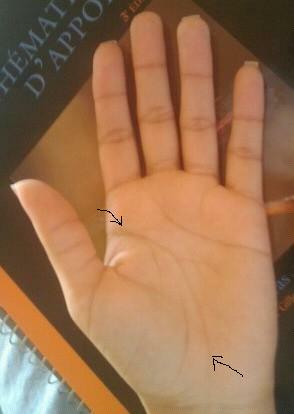 Another healer marker on the hand is indicated by the head line starting an inch or so below the index finger on the inside of the palm and is drawn downward toward the middle of the palm then curves down to the lower center part of the palm, near the wrist. See the example to the left with the head line stretching between the arrows. This type of head line is not to be mistaken for the life line. The life line is the line closest to the inset of the thumb and wraps around the mount at the base where the thumb plugs into the palm. The owner of this long and curvy head line can work in the deepest part of their emotions. He or she is wired to support others who are also moving in and out of the abyss. Hospice workers utilize this symbol through their service by creatively connecting individuals with emotions related to sadness and loss. If the owner of this line is unaware of their calling they might find him or herself in and out of depressive states of being without understanding why. A benefit of sitting with these deep and sometimes disturbing emotions is the acquired ability to compassionately help others who also struggle in this arena. One other type of healer-marker on the hand is having a fingerprint in the shape of a whorl on both pinkies or the left pinkie only. 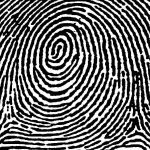 A whorl print looks like the rings circling the core of a cut down tree. The skills required here are to communicate openly and completely in relationship. If in partnership, he or she must communicate fully and appropriately to their partner. Speaking the truth promotes valuable communication in relationship and thus advances intimacy – characterizing one’s deepest nature. Intimacy allows and inspires a whole relationship with others and oneself. One must talk about their feelings and express what does or doesn’t work for them. This can also be associated with appropriate surrender – not too much, not too little – just right- like Goldilocks. In all cases, a healer must listen – to his or her inner self and to the other – and then follow their intuitive guidance. As one learns to communicate with clarity, from their ‘truth’, he or she will find more opportunities for uplifting others. This will also give the person a more complete and whole feeling ‘within’. Voila’- the creative space for healing is more expansive AND accessible than before. 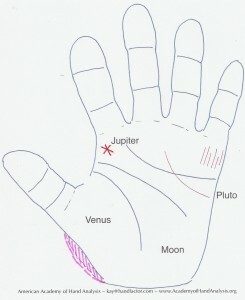 Whether you’ve found any of these markers on your hands, or you’re already working as a Healer, any of these skills will contribute to your success: 1) Trust your Self – what you SENSE (see, hear, feel, smell, intuit) 2) Allow your feelings to surface 3) Communicate your feelings and wants 4) Embrace all lessons with gratitude. All associated growth will help others besides yourself. Remember, you can lead a horse to water but you can’t make it drink. It’s not the healer’s job to fix another being. Healers actually help shift the perspective of an individual when s/he is ready and willing. Are you ready, willing and open to practice the skills necessary to encourage others to launch into their higher Being? It could make a difference beyond your wildest dreams. Want to learn more? Come train with the American Academy of Hand Analysis!